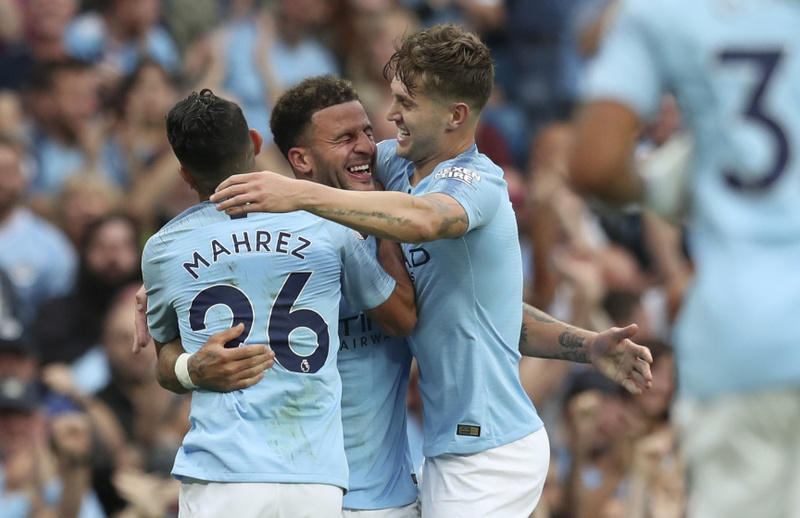 MANCHESTER, England (AP) — Kyle Walker drove in the winning goal from 30 meters as Manchester City broke down Newcastle's dogged resilience in a 2-1 victory in the English Premier League on Saturday. The England right back received the ball from Sergio Aguero, took a touch, and fired an angled shot into the bottom corner in the 52nd minute for his first goal in almost three years. The win put City's title defense back on track after a 1-1 draw at Wolverampton Wanderers last weekend. Another marauding right back tied the score after 30 minutes, with U.S. international DeAndre Yedlin sweeping in a close-range finish from Salomon Rondon's cross in a rare attack from Newcastle. Raheem Sterling's eighth-minute opener, on his 100th Premier League appearance for City, came at the start of a first half that resembled an attack-vs.-defense training-ground exercise, as the visitors regularly ceded possession. If Newcastle captain Jamaal Lascelles, restored to the starting lineup after injury, was looking to redeem himself after a reported training ground fracas with Matt Ritchie, the center back failed miserably. Lascelles gifted possession to Benjamin Mendy, who released Sterling outside him, and the England international cut in from the left to curl a shot across goalkeeper Martin Dubravka and inside the far post. Aguero, who came into the match having scored 14 goals in 11 appearances against Newcastle, whipped an effort wide from distance while Gabriel Jesus shot straight at Dubravka as City laid siege on Newcastle's goal. But the home side conceded a sloppy goal when Kenedy played in Rondon on the left and the striker slid a low cross into the six-yard box toward the far post where Mendy would normally have been guarding. However, the left back had been dragged into the middle and Yedlin capitalized by beating the back-tracking Jesus to the ball and converting. It was Yedlin's first Premier League goal and first goal anywhere since Sept. 10, 2016, against Derby in the English League Cup. He scored an own-goal in Newcastle's 2-1 loss to Chelsea last weekend. Walker's goal saw City regain the lead and appeared to break Newcastle's resolve, with Jesus soon denied by an offside flag before Dubravka made a double save from Fernandinho and David Silva. The result leaves Newcastle with just one point — a draw against newly promoted Cardiff — and manager Rafa Benitez, after its League Cup exit to second-tier Nottingham Forest in midweek, with more questions to answer.